It’s a growing issue with email — you sign up for a newsletter service and you never receive an issue. Why? In many cases, whitelisting the sender of the newsletter is critical to ensure delivery. That is, adding the senders email address to your email software or service will ensure that your email newsletters will get into your inbox. Here are whitelisting tips for Microsoft Outlook, AOL, Yahoo, Hotmail, Gmail, and Mozilla Thunderbird to ensure that your the 420 Archive newsletters arrive each and every month. Have questions? Email info@420archive.org anytime. 2. Wait for the “Address Book” window to pop up, then click the Add button. 3. Wait for the “Address Card for New Contact” window to load. 4. Paste info@420archive.org into the “Other E-Mail” field. 5. Make our From address the “Primary E-Mail” address by checking the associated check box. If our newsletter is in your AOL Spam Folder, please open the issue and then click the This Is Not Spam button. Next, please add info@420archive.org onto your Address Book as described above. 4. 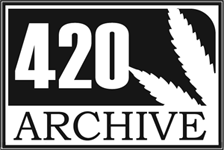 Update the “From header:” rule with the following 2 pieces of information: “contains” and info@420archive.org. (This tells Yahoo to identify our newsletter based on its From address. If our newsletter is getting stuck in your Yahoo Bulk Folder, please open the issue and click the Not Spam button. Next, check to see if the newsletter’s email address is in your “Blocked Addresses” list. If you see info@420archive.org on this list, select it and click the Remove Block button. Lastly, please set up a filter as outlined above. 4. Copy and paste info@420archive.org into the dialog box titled “Type an address or domain”. If our newsletter is in your Junk E-Mail Folder, open the issue and click the Not Junk button. Next, check to see if our email address is in your Blocked Senders list. If you see info@420archive.org on this list, select it and click the Remove button. Finally, if you have not done so, add info@420archive.org into your Safe List as outlined above. 3. Copy and paste our From address, info@420archive.org into the primary email address dialog box. You will need to add our From address, info@420archive.org, to your Thunderbird Address Book and configure your Junk Mail Controls to whitelist your address book. 4. Under the Contact tab, copy and paste our “From” address, info@420archive.org into the Email dialog box. 3. Under the Settings tab, update the “whitelists” module by selecting Personal Address Book from the pull down menu and then check mark the box next to “Do not mark messages as junk mail”.